Also known as Maol. The alternative name is confirmed by the presence of Coimín na Maoile and Loch na Maoile on its slopes. 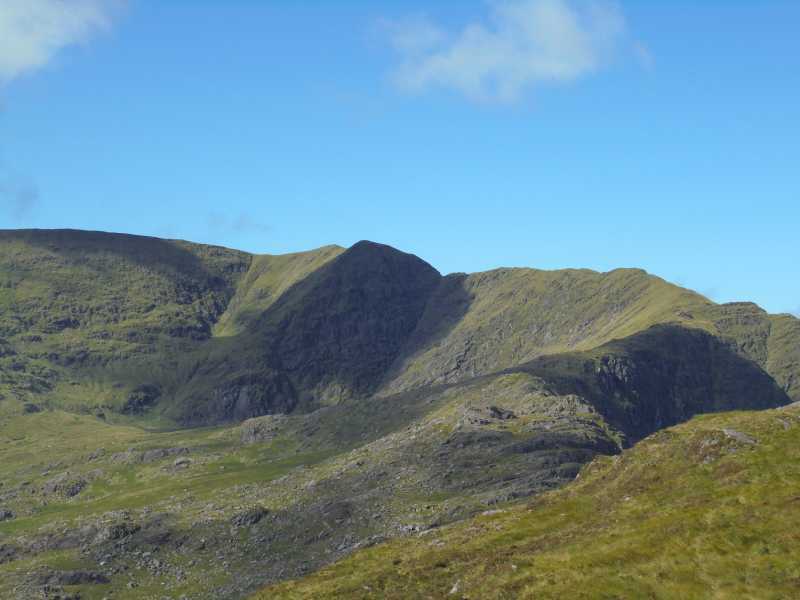 Stumpa Dúloigh is the highest mountain in the Dunkerron Mountains area and the 55th highest in Ireland. Captain Vertigo and I have posted tracks separated by only a few days, covering similar ground and centred around Stumpa Duloigh. My track (3080) took an anti-clockwise direction while the Captain (3108) proceeded clockwise. Consequently we approached Stumpa Duloigh, and most significantly point 776 (V 78796 79545 D) immediately north of the summit, from different directions, with me ascending and Captain Vertigo descending. For the Captain, point 766 was very much the crux of the route (leaving out the ascent of Mothaillin…). In my case, on reaching V78722 79635 E This grid reference in the text is shown as point E on the Detail Map above'>V78722 79635 E E, where the Stumpa Duloigh ridge meets the rise to point 776, I faced some infeasibly steep ground which was horribly exposed to the 300m plunge into Lough Duff. However, having the benefit of sight lines, I was able to detour west onto less steep ground around the obstacle. What remains is still steep, but without the sheer horror of the direct line. Approaching from point 766, without a clear view of the obstacle, the Captain faced descending onto this steep ground blind and from above – not a nice thought.